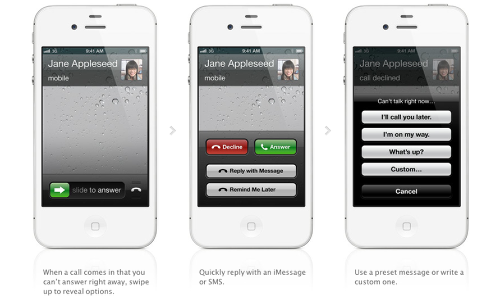 With its easy-to-use interface, amazing features and rock-solid stability, iOS is the foundation of iPhone. 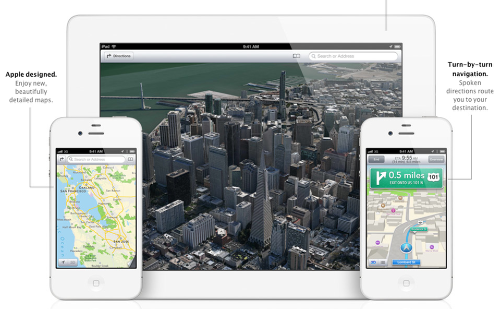 And even as others try to catch up, the technologies and features built into iOS keep iPhone years ahead. Now you can share just the photos you want, with just the people you choose. Simply select photos from the Photos app, tap the Share button, choose who you want to share your photos with, and they’re on their way. 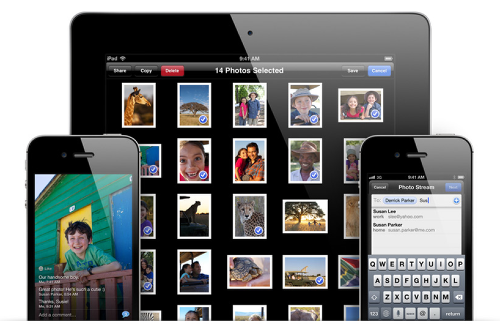 Friends using iCloud on an iOS 6 device or a Mac running Mountain Lion get the photos delivered immediately in the Photos app or iPhoto.3 You can even view shared photo streams on Apple TV. 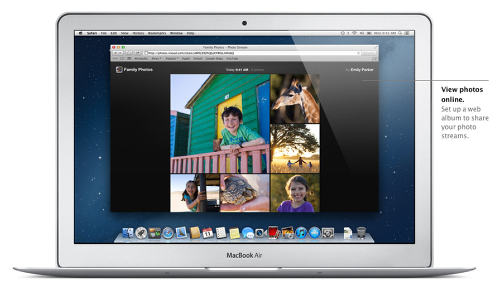 If the folks you’re sharing with aren’t using an Apple device, they can view your photos on the web. People can like individual photos and make comments. And you can share as much as you want: Your shared photo streams don’t count against your iCloud storage, and they work over Wi-Fi and cellular networks. FaceTime now works over cellular networks as well as Wi-Fi, so you can make and receive FaceTime calls wherever you happen to be. 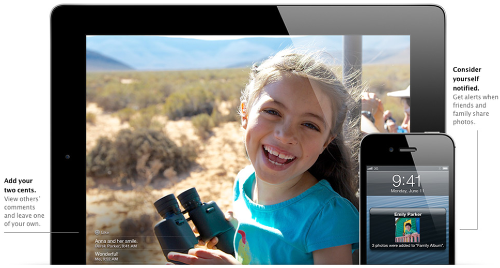 You can even make and receive FaceTime calls on your iPad using your phone number. 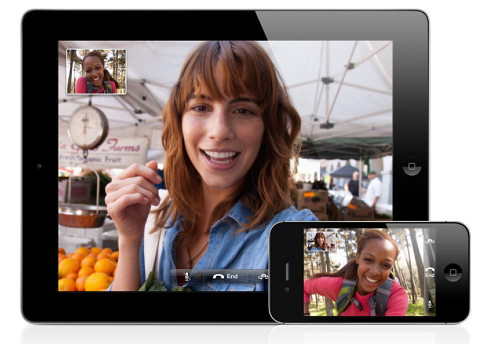 That means you can use FaceTime wherever you are, on any device. And never miss another wink, smile, air kiss, or eye roll. 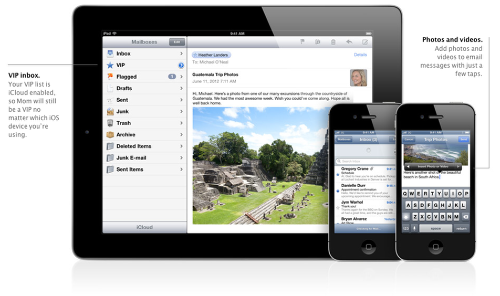 Redesigned with a more streamlined interface for easier reading and writing, Mail in iOS 6 lets you set up a VIP list so you’ll never miss an important message from your accountant, your boss, or your BFF.5 It’s even easier to add photos and videos to email messages. And to refresh your mailboxes, all you have to do is swipe down. 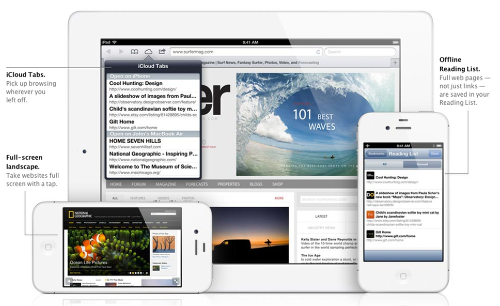 iOS 6 brings even better web browsing to your iPhone, iPad, and iPod touch. iCloud Tabs keeps track of which pages you have open on your devices, so you can start browsing on one device and pick up right where you left off on whatever device is handy. Safari now saves web pages — not just links — in your Reading List, so you can catch up on your reading even when you can’t connect to the Internet.6 And when you’re posting a photo or video to eBay, Craigslist, or another site, you can take photos and video — or choose from your Camera Roll — without leaving Safari. 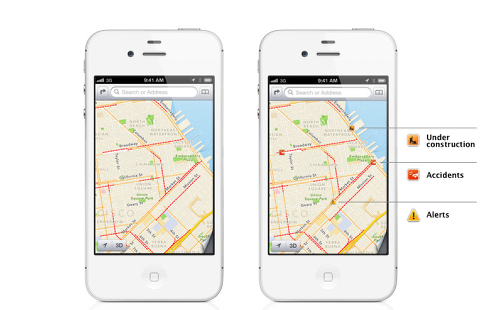 When you really want to see the whole picture, turn your iPhone or iPod touch to landscape and tap the full-screen icon to view web pages without distractions. 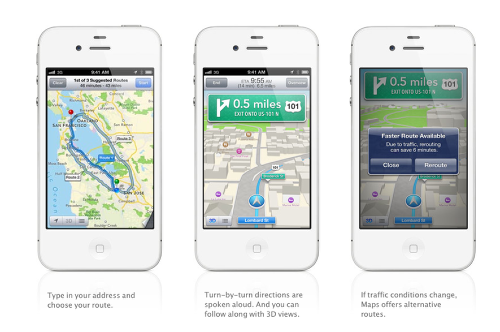 Maps uses real-time traffic conditions to calculate your ETA. You’ll also get details about incidents that are causing traffic jams, so you can tell if there’s a major accident ahead or just a temporary slowdown. See the world from a whole new perspective with amazing photo-realistic and interactive 3D views of major metro areas. 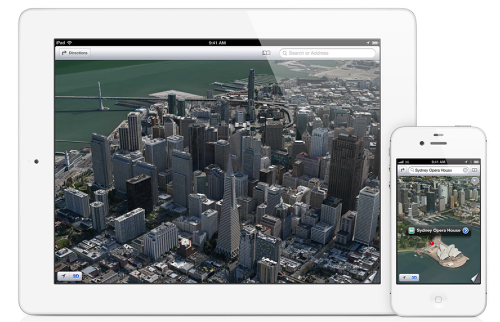 Explore like never before as you zoom, pan, tilt, and rotate around a city and its landmarks. 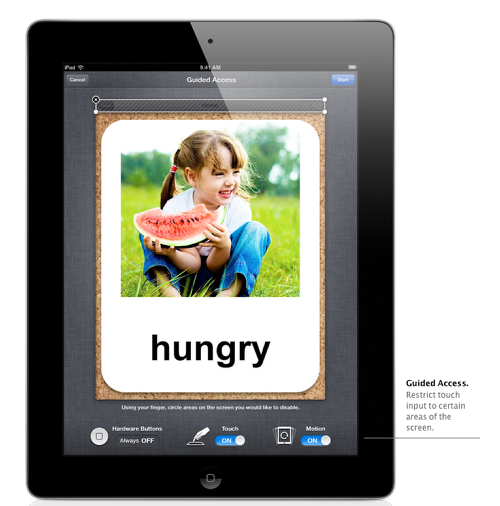 With iOS 6, Siri understands more languages, works in more countries, and is available on the new iPad.2 So you can get more things done in more places around the world. Want to know the latest scores and stats for your favorite teams and players? Thanks to iOS 6, Siri knows the answers. Or maybe it’s movie night. 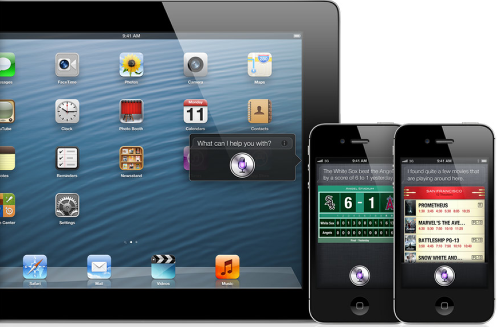 Siri can show you the latest reviews and showtimes. Find the best restaurants in town and make reservations. Even open your apps for you — no tapping required. Say "Launch Flight Tracker" or "Open Where’s My Water" and Siri does just that. 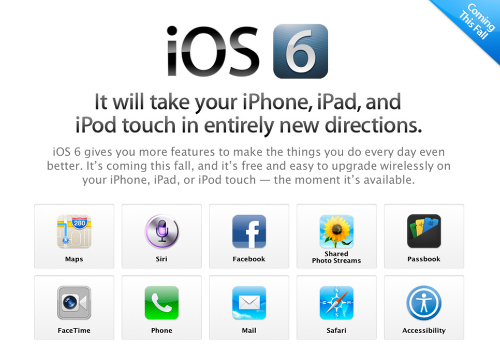 You can even use Siri to post Facebook updates and tweet for you, too. your joking right? “and even as others try to catch up”……..
nothing new…enjoying those on galaxy S2 for a long time (which came out before 4s)?